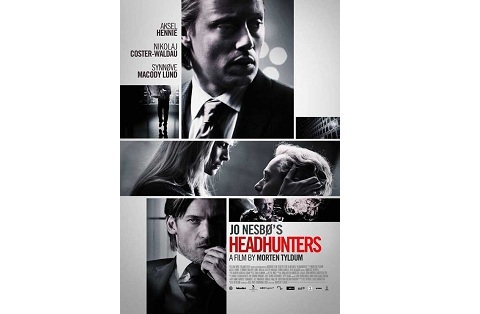 I missed Headhunters while it was still showing in the theatres, but finally watched it on DVD the other day. The novel had a very complicated plot and I was eager to see how the novel would translate to the big screen. The main character is the Norwegian headhunter and art thief Roger Brown. His wife and art gallery owner Diana Brown wants children but he wants to have their future financially secured first. The big break seems to come when Diana introduces him to Clas Greve, an Executive and former Special Forces soldier, who owns a priceless painting. But once Roger has stolen the painting everything starts to go wrong and he is forced to run for his life. I can imagine that it could be difficult to follow the plot at times if you had not read the novel, but the fact that I was hiding behind a throw pillow for a good part of the movie (even though I had already read the novel!) says a lot about the level of suspense. I was also wondering how some scenes in the novel would be pulled off in the movie (if at all), but they portrayed them quite well. I recommend both the novel and the movie, preferably in that order.